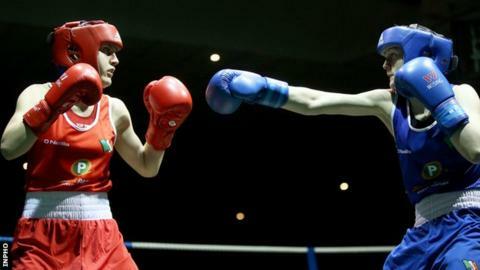 Cavan boxer Ceire Smith has replaced injured Belfast flyweight Michaela Walsh in the Ireland squad for the upcoming Olympic qualifiers. Commonwealth Games silver medallist Walsh, 22, had been scheduled to be one of the nine fighters aiming to clinch their Rio Games spots in Turkey. However, Walsh has been forced to pull out of the competition after sustaining an injury in training last week. Walsh defeated Smith at the Irish National Finals last November. An Irish Athletics Boxing Association official told BBC Sport that Walsh sustained the injury on 23 March during a training camp at the High Performance Unit in Dublin. "In order to prevent any further damage to the injury, she has been advised by the medical staff to rest and recover," added the spokesman. "Ceire Smith from Cavan BC and the number two Irish flyweight has replaced Michaela on the team for this tournament." While Walsh is going to miss next month's Olympic qualifying tournament in Samsun, she could still her book her Rio place at the World Championships in Kazakhstan in May. However, Smith will in pole position for the Olympic spot if she reaches the final of the 51kg division in Turkey, with the top two in the division earning Rio berths. The Cavan fighter's rivals will include Britain's reigning Olympic champion Nicola Adams. London Olympic lightweight gold medallist Katie Taylor will be among the Irish fighters aiming to secure Olympic places in Turkey. Cork middleweight Christina Desmond will be the third Irish female competing in Turkey while Belfast man Brendan Irvine also competes in Samsun after moving up to the flyweight division. Irvine is trying his luck in the 52kg division with double Olympic bronze medallist Paddy Barnes having already nailed down Ireland's light-flyweight spot. David Oliver Joyce, Dean Walsh, Michael O'Reilly, Darren O'Neill and Dean Gardiner will also be aiming to secure their Olympic spots in Turkey. The top three finishers in the 10 men's divisions in Samsun will clinch Rio qualification. Barnes, his fellow Olympic medallist Michael Conlan, Steven Donnelly and Joe Ward have already qualified for the Olympics.